The 200 yard learning experience! All of us love to blast driver as far as we possibly can. When given a choice on a hole, most of us would choose driver as much as we could. However, if we were truly trying to shoot the lowest score we might take a slightly different approach on certain holes. The pro’s show us on TV all the time that sometimes hitting a 3 wood or long iron puts a player in the best position to score. Mitchell started his Operation 36 journey in the matches on September 6th, 2015. He was 14 years old and could hit the ball a good distance. Thus, the first few yardages he could easily reach the green in 1 shot. He breezed through the first few yardages shooting a blistering 29, 30, 29 and 32 from 25 yards, 50 yards, 100 yards and 150 yards. He completed the first 4 Divisions in 1 attempt each. On October 4th, 2015 he started his journey from 200 yards with a score of 48. Who would have thought the jump from 150 yards to 200 yards would have been that different? Mitchell has been a great role model for our younger students as he has come back and taught our 7-10 year old classes. He’s an active member of his community in his church youth group doing service projects and missionary trips throughout the Southeast. He has been a member of the Harnett County High School Golf team the past two seasons and qualified to play in a handful of matches. He also competes in cross country, wrestling and basketball. He has been a member of the Operation 36 All Star team for Keith Hills on 3 separate occasions. Mitchell is now working diligently to beat 36 from the Orange tees at Keith Hills in the Operation 36 matches. His low score this spring was a 38 and something tells me it’s not going to take him 21 attempts to beat this yardage. 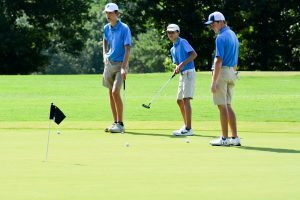 He’s learned a lot from his time at 200 yards that will carry with him into his junior tournaments, high school matches and future Operation 36 matches.